Southern state governments passed Civil Rights bills, including allowing blacks the right to vote, as they worked with the Federal government to regain entry into the union. Mississippi decided to send America’s first black U.S. Senator, Hiram Rhodes Revels, to Washington in January of 1870. (see The Forgotten Senator) However, it is widely accepted Mississippi’s State Senate chose Revels more for political reasons to rejoin the Union than for fairness, especially since Washington Democrats immediately fought it. 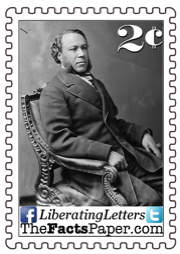 Regardless, he made an impact and citizens soon began voting blacks into Federal office themselves, starting with Joseph Hayne Rainey. Rainey was born into slavery on June 21, 1832, in Georgetown, South Carolina. As some slaves were permitted to do, Rainey’s father, Edward, was allowed to work independently as a barber. Despite having to give his owner a portion of his earnings by law, Edward saved enough money to buy freedom for himself, his wife, and their two sons in the 1840’s. A very successful barber, Edward even purchased two of his own slaves in the 1850’s. Laws prohibited education for black children, so Edward trained his son in his trade. During a trip to Philadelphia, Pennsylvania, Rainey met and married Susan, a free woman of African-French descent from the West Indies. The couple returned to South Carolina and started a family consisting of three children: Joseph II, Herbert and Olivia. Free from the chains of slavery, Rainey still could not escape the bonds of a government draft. When the Civil War broke out in 1861, the new Confederate government drafted free blacks, including Rainey. He first worked in Charleston building fortifications, but expanded his contributions to cooking and as a laborer on blockade-runner ships. In 1862, Joseph and Susan gathered their boys and escaped to the free colony of Bermuda, where Joseph resumed his barber career and Susan opened a shop. The couple became successful and prominent citizens in their community, but returned to South Carolina in 1866 following the war. As the Reconstruction Era commenced, Rainey entered the political scene by joining the executive committee of his state’s newly formed Republican Party. When South Carolina convened a Constitutional Convention in 1868, the party chose Rainey as a delegate. Among other governmental jobs, Rainey was Georgetown’s census taker in 1869. Citizens elected him in 1870 to the State Senate for a four-year term where he was chosen as the Chairman of the Finance Committee. When Republican incumbent U.S. Representative Benjamin F. Whittemore was forced to resign his seat, Rainey won his seat in a special election. Sworn in on December 12, 1870, Rainey became the first member of the United States House of Representatives of color. He won re-election to Congress three more times, serving a total of four terms. Upon his leaving the Congress on March 3, 1879, Joseph’s tenure was the longest for any black Congressman until Chicago’s William L. Dawson served his fifth term in the 1950’s. The bill did pass despite complete objection from the Democratic Party. Following his speech, Rainey and other black civil rights activists received a letter written in red ink, suggesting they “prepare to meet your God.” President Ulysses S. Grant signed the bill into law on April 20, 1871, yet it did very little to stop the KKK’s violence. Southerners virtually ignored it and Democrats in Congress eliminated funding. Rainey took to the floor again in March of 1872 to push for federal appropriations to enforce the law. Also in 1871, Democrat Representative Samuel S. Cox from New York made a statement again placing South Carolina’s unrest upon the shoulders of the black Republican legislators. Rainey responded to his remarks, clearly defining the instigators as the Democratic Party. Rainey then proposed how the country could truly test the Democratic Party’s commitment to Negroes. Rainey championed several Civil Rights bills, supporting all minorities, including Native Americans and Chinese. Serving on several committees, he made history again in May 1874, presiding over the House as the first black Speaker pro tempore. Despite blacks in state legislatures displaying fairness, equality, and charity to Confederates during Reconstruction, as Lincoln called for, once Southern Democrats were back in power they immediately started passing Black Codes, Jim Crow Laws, poll taxes, and other such legislation to enslave the blacks with government instead of chains. (see Civil Rights…And Wrongs) Democrats gerrymandered districts, ensuring all blacks lost their House seats, including Rainey and fellow South Carolinian, Robert Smalls. (see From House Slave To House Of Representatives) Some historians claim the black population fell out of politics because most were still uneducated at the time. However, so were many whites. The truth is, the self-educated, successful, and intelligent black elected officials were forced out of office as Democrats regained power. Once ex-Confederates were granted voting rights when Reconstruction ended, blacks lost their voice once more. Rainey received an appointment as a U.S. Internal Revenue agent of South Carolina, where he served until 1881. After a short time in banking and brokerage positions in Washington D.C., Rainey retired to South Carolina in 1886. He died in Georgetown on August 1, 1887, of congestive fever and was buried in the town’s Baptist Cemetery. There is a reason why Progressives, who have overtaken America's education system, refuse to teach about such heroes as Joseph H. Rainey. His words completely expose that the Democratic Party hasn't changed since its inception in 1828. It is the party of racism, slavery, and oppression, while the Republican Party is the true party of liberty and freedom. That is why it is imperative we keep Rainey, and the others, alive in America's hearts and minds. The guns were silent. The dead were buried. The battlefields were empty. But for the Negros in the South, the true fight for freedom was just beginning. Despite contending with Southern Democrat President Andrew Johnson’s every objection, Republicans pushed forth Civil Rights legislation and Amendments during the Reconstruction Era. (see How The South Was Won and Civil Rights…And Wrongs) Their efforts were overwhelmingly supported by the Negros they were liberating. As Frederick Douglass stated, “I am a Republican, a black, dyed in the wool Republican, and I never intend to belong to any other party than the party of freedom and progress.” (see Reading, Writing, & Redemption) At the time, basically every African-American citizen felt the exact same way. Blacks, both former slaves and freemen, started entering politics on the state level, and they all did so as Republicans.